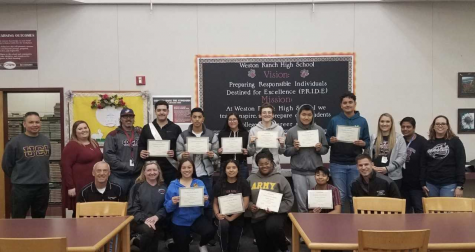 On March 27th, Mr. Ribota escorted a group of Weston Ranch students who were allowed to visit the San Joaquin County courthouse, and they were able to experience what happens at a courthouse. For most of the students, it had been their first experience in a courthouse. The students were able to see a courthouse room in progress so, and the visit was not just viewing the house, they were also able to see how the courthouse functioned. The students were glad that they were ready to go and learn from the trip. courthouse. A big highlight of the trip was when the students were able to talk to the judge, one on one, and ask the judge questions. Everyone was able to see the whole courthouse, and they also got an exclusive tour of the judge’s office. It’s hard to get that tour because the public is not allowed to explore the judge’s personal office space without a search warrant. It was a good experience for the students to go around and see the courthouse. Along with visiting with the judge and viewing the quarters, the students were able to see how the judge acts and see the judicial process. Students in attendance got to know the judge to be a little more human rather than the judges on TV who may be harsh and emotionless. They saw the judge try to deal with the defendants by giving the more humane message of “don’t do the crime again” rather than just saying you did the crime, which the students appreciated. The students’ visit to the courthouse offered good insight on what happens in a courthouse and how everything is handled. The students were also able to speak with attorneys representing defendants and prosecutors regarding their roles in protecting the rights contained within the US Constitution, and how those careers were worthwhile to the public good. Their experiences together, combined with seeing how the courtroom works, really benefitted their future career aspirations and gave them a new perspective about how courts in the real world.